I can't believe it. 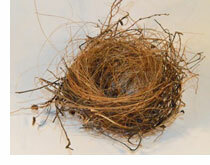 Our nest is empty once again -- after our son and his family moved away early this month. Yes, our place is much quieter and cleaner, but life is not the same without them. It was like yesterday that James and I drove our son to college in September 2001. I still remember how much I lingered on, trying to stay longer, two hours at a time. In the next few months, every time I walked passed his room, sat down for family meals, or even worked on my computer, I felt something missing. You see, in his growing up years, our family room had three computers on three built-in desks along one wall and a Ping Pong table in the middle of the room. We could study, work and play together! Children grow up fast! Before we knew it, our son graduated from college (and later from seminary) and now has a life and family of his own. In 2010, he even took his wife and their young daughter to Africa and worked there for three years. 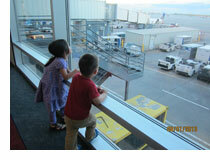 It was hard to let them go, but every departure has become easier as we look forward to family reunions in the future. Thank God that we have made a heart to heart connection while together, and we can continue to maintain our long distance relationship via technology. What a pleasant surprise it was to have them stay with us the past six months. Of course, I still miss having two cute little kids knocking on our door. Who can resist playing with or reading a story to their grandchildren? I know it is not always easy to enjoy your kids if you are a mom or dad who is trying to advance your career while developing and disciplining them -- I was there myself. Are you feeling tired? Frustrated? Stressed? Take a break from your busyness and envision them being adults one day. This feature article, The Empty Nest: When the Young Birds Fly Away, suggests how to prepare for -- and make the best of -- your Empty Nest years! Parenting is a repeated process of getting our children ready and letting them go, one step at a time, until one day they become mature adults. In a few weeks, whether your kids are starting preschool, kindergarten, or college, you are releasing them to the world one step further. Whether it is obvious or not, most people have experienced some separation anxiety in life. How we handle and express our anxiety might be helpful or harmful for our children as they face the unknowns. It was not easy when our son went to college. Even though I have taken years to get mentally ready, things did not happen my way. Four days after the 911 terrorist attacks in 2011, James and I took our son to college. We stayed at a friend's house nearby so that we could arrive at the campus early. Following instructions, we lined up for the freshmen move-in service a few blocks from his dorm. The line moved faster than expected. Before long, we reached the front, and strong muscled upper-classmen unloaded all belongings of our teenager and put them into canvas containers. With ease, they rolled the huge containers through winding pathways connecting different buildings. Before we knew it, everything was in the upstairs suite where our son would live with five other guys. With lightning speed, our teen set up his PC and made sure everything worked. As I was making his extra long bed, he and James took turn checking their e-mails. Sitting in front of his desk in his single room, he put his hands behind his head, looked out the window, and proclaimed, "This place is like a palace." Not wasting a moment, James said, "It's time to go." Caught by surprise, I uttered, "Let's check out the bookstore and help him get his books." I could not believe how fast our son found and paid for his books. When James said, "Let's go" again, I looked at my watch. "Hey, it's almost noon, let's have lunch. We can stay a couple more hours." As we walked around campus, we grew quiet. Feeling sad and angry, I kept on asking myself, "Why are they so eager to part?" I remembered friends telling me how their kids (mostly teenage girls) would not let them leave. Imagining no one cared about me, I felt overwhelmed with mixed emotions. Finally, I could no longer pretend to be happy. At the cafeteria table, with tears welling in my eyes, I said, "I feel very sad right now" and bursted out my struggles and anxieties -- 911 just happened and there were more threats; my mom died of a heart attack two years after I came to the United States for college ... Thank God that they listened and understood! After lunch I suggested, "Let's take some pictures on campus. Mom will be on her way in a couple of hours." We all started laughing at my delay tactic. Two hours later, James took our final photo with our almost six-foot tall son wrapping his arm around my shoulders. The tears in my eyes and the smile on my face remind me of that bittersweet experience. It is always hard for parents to let go -- all we can do is to believe that we have tried our best (that is the best that we know how) and let God take care of our children. Is it going to be easy? No! If you need some support and prayers, please send me an e-mail. Working with families around the world has allowed me to see the universal effect of parenting. From the second they arrive on the planet, just inches long and utterly dependent, our children occupy a place in our hearts deeper than most any other relationship. We nurture, guide, feed and protect them for years. The relationship brings us a complex mixture of joy, frustration, sadness, delight, anger, pride and love. Our children occupy our focus like nothing else, as they grow taller and more independent every year. Of course, we knew that from the beginning. And that's been the goal all along. But that doesn't make an empty nest any easier when it finally comes. Fortunately, an empty nest is also the beginning of another era for parents, one that can be equally fulfilling. I'll say the loving relationship between James and I is much deeper and wider now than when we were in our honeymoon; and we have grown so much together in Christ the last twelve years (in our empty nest). Most women don't fall apart. Unlike the common perception, it's not typical for most women to experience lingering depression, or loss of purpose and identity. Though they experienced sadness, mothers in a 2008 University of Missouri study spoke more about their pride and joy in watching their kids make this transition and the relief they felt in seeing the fruits of their labor realized. Carin Rubenstein, PhD, author of Beyond the Mommy Years: How to Live Happily Ever After...After the Kids Leave Home, says that about 10% of mothers are more severely affected when their children leave home, and the problem may be more long-term. They worry that their children aren't ready for adult responsibilities. Other "letting go" times, such as weaning or sending children to school, were painful. If you are having severe reactions (crying excessively, so sad you don't want to see friends or go to work, feeling your useful life has ended), consider seeking professional help. Feel your feelings. But don't burden your children with them. Once they've left, ration your calls to once or twice a week. Try texting. The more they feel you clinging, the more they'll pull away. Get support. If you're going through menopause, or having to care for elderly parents, your feelings may be exacerbated. Speak with a physician if you're experiencing difficult menopausal symptoms, and consider ways to take a break from your caregiving to take care of YOU. Dream and do. Use your greater freedom and relaxed responsibility to get back in touch with your own dreams and aspirations. Make a list of all the hobbies you'd like to pursue, or classes you'd like to take. Spend time that you didn't have before developing new friendships. Dive into that new business or career that you've been dreaming about. Above all, forgive yourself for not being a "perfect" parent, and acknowledge all that you've been able to provide for your children. Focus on letting go and trusting God that your child is on his or her path -- bumps and all -- and will be fine. And you will be, too.